This sweet and delicious caramel apple dip has only 4 ingredients, and it is delicious with fresh apple slices! 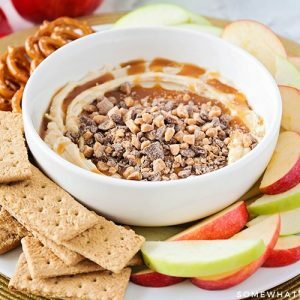 If you're looking for an easy fall dessert, this caramel apple dip recipe is PERFECT! In a medium bowl, beat the cream cheese and brown sugar until smooth. Scoop the mixture into a small serving bowl. Drizzle with the caramel ice cream topping, then sprinkle with the Heath bits. Serve with fresh apple slices, pretzels, and graham crackers. Refrigerate until ready to serve.